Some years ago I decided to try and have each of my Necromunda gangs painted by one of my gaming friends. 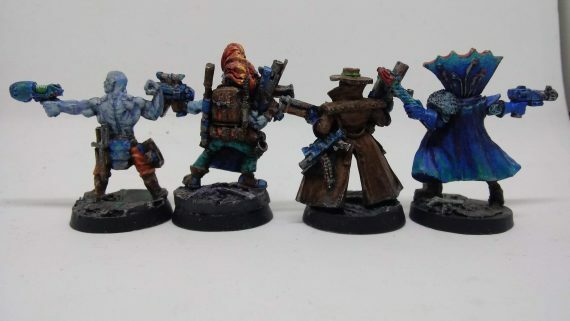 The latest -and possibly last- installment is a batch of Necromunda characters painted by long time CSW member Jon. These represent some of the most iconic Necromunda supporting cast members and I'm thrilled with the results. I did the assembly and some small modifications and mounted them on resin bases of unknown manufacture representing industrial ruins. Jon did all the paintwork. First of all we have two of the classic Necromunda Bounty Hunters. 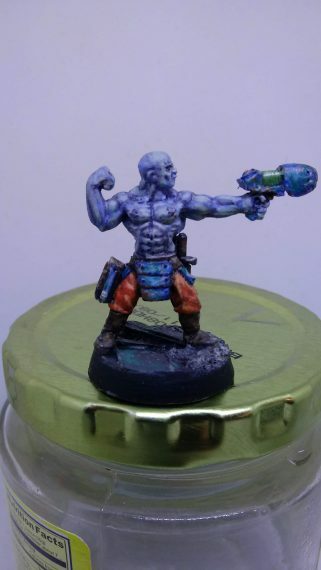 These appeared in the original Necromunda rules in relatively fixed configurations armed exactly as they were sculpted. This first fellow is stock and is a great play on the classic wild-west bounty hunter. This second iconic fellow arrived missing his backpack. I replaced the missing piece with a backpack originally sculpted by Steve Jackson for the IG-esque' "Corporation" faction of the Shock Force game. Also to retain the original gear selection I attached a Hasslefree miniatures shotgun. 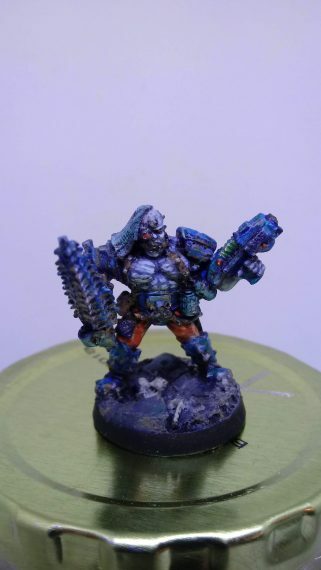 Moving on is my take on the classic Necromunda Scummer. For the armament I attached a selection that matches the classic scum loadout but the figure is actually another descendant of the Shockforce game. 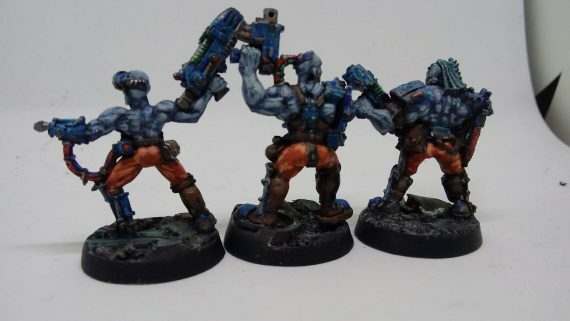 Returning to original Necromunda miniatures, here's a selection of 3 Pit Slaves. 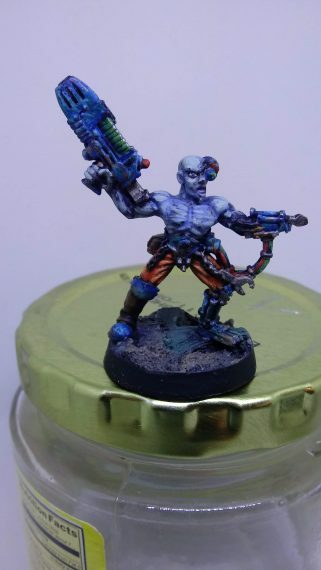 Not much to report other than they're fantastic examples of the style and character of the first era of Necromunda. 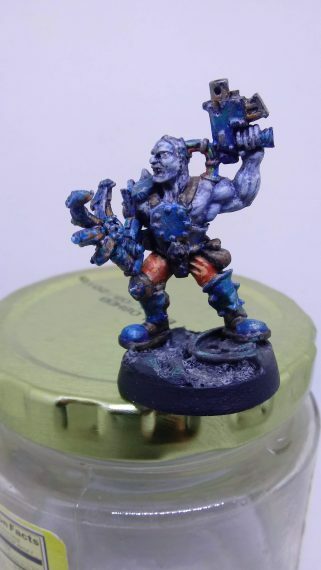 These were among the last figures sculpted in 1997 for the first edition of Necromunda and are something of a high point for the line. This first fellow has a good bit of Goliath influence. More miniatures would trickle out over the next few years with gangs getting new releases in the 00's but by then the style had changed, becoming chunkier compared to the look you see here. This guy also has some of the Goliath look, especially in his footwear. Though I have no plans to make a full pit slave gang, these figures are great as hired guns or simply as colorful ways to give WYSIWYG representation to "Special" or Close Combat loadouts that a given gang might not have in it's figure range. 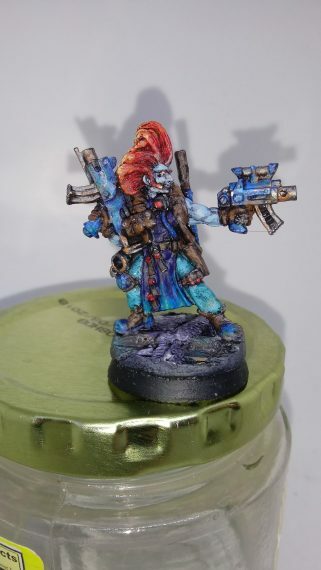 This one is particularly useful in that regard as many of the classic Necromunda gangs did not include a figure with a plasma gun. Lastly is this oddity. 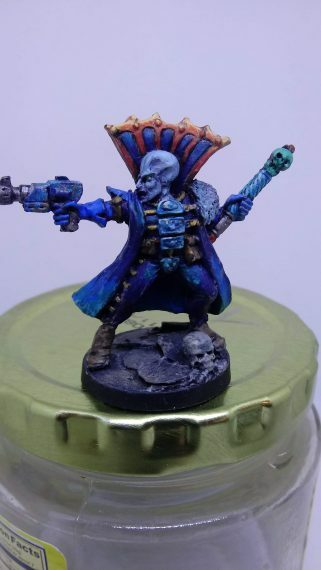 Not a Necromunda miniature, this "Imperial Psyker 2" predates Necromunda by a couple of years. I acquired him from Tim some years ago and finally here he is in high style. 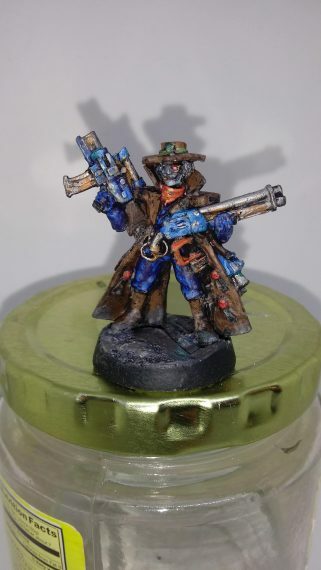 It's a fantastic miniature for representing a Wyrd or some other psyker in Necromunda or any other Sci-Fantasy setting. Lastly, here's pictures of the backs of the figures. In true Necromunda style there's lots of great detail and gear on these figs no matter what angle you see them from. To say I'm happy with these is an understatement. Jon has done a fantastic job. His artistic style and skilled brushwork is evident throughout and these will be a welcome addition to my collection. I fear that even in my light box I was unable to capture the beauty of his work with the pictures either coming out too dark or too contrasted, but I trust that his talent comes through anyway. -Van Saar by me. Some the first gaming figures I purchased, along with a few more recent additions. -Escher from Mattias. Possibly my favorite GW figures ever. Done up right. -Cawdor from Tim. A cool, original take brightens up the colors on these classic cultists. -Delaque from Josh. Airbrush paintwork brings a modern look to a gang made of uber-affordable "Slicks" by East Riding Miniatures. -Orlock from Pat. A mix of GW and others and some fun conversions makes for a unique flavorful gang. I've still got aspirations to someday paint up a Goliath Gang with the current (and appropriately larger) figures and a Chaos Cultist gang, but those projects will keep and I feel plenty lucky to have the gangs I do. Cool batch of classic minis and cool article layout, Karl! I like the links to the old related stuff also to see the different paintjobs! My apologies to John, for not getting this up sooner. I’m glad you like seeing the rest of the project. This collecton has been a few years time coming together, but totally worth it. I’m not sure when I’ll be playing Necromunda (new or classic version) again, but when it happens it will be nice to have plenty of gangs to share!